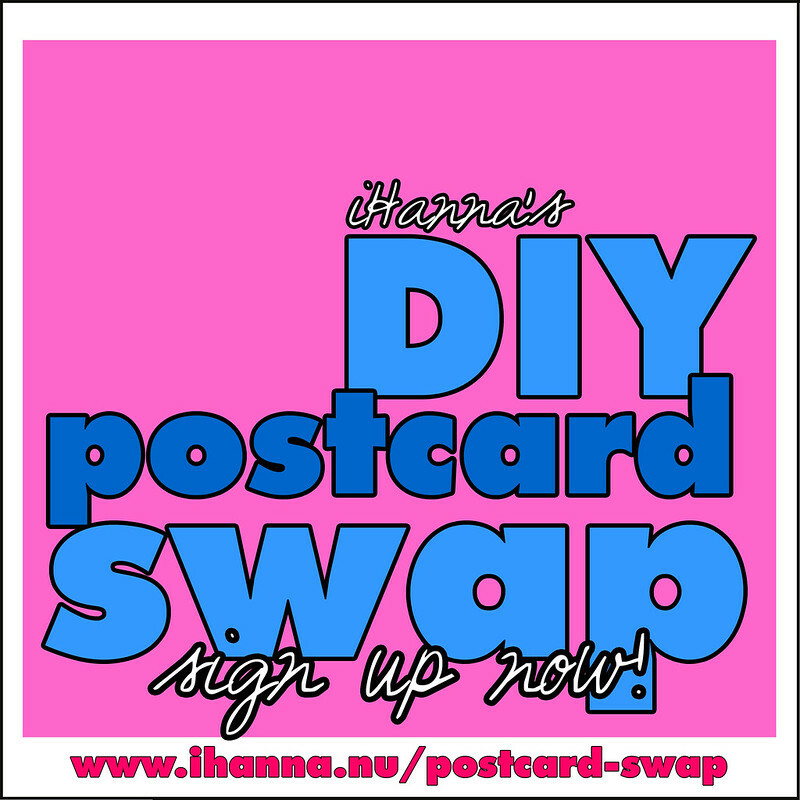 Do you want to join the best handmade Postcard Swap on the web? 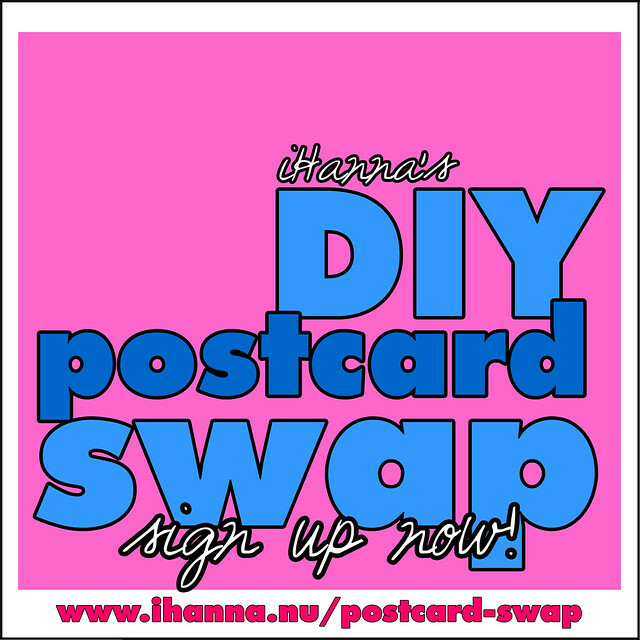 Here’s your invitation to join the DIY Postcard Swap that I host twice each year, where hundreds of postcards get created, shared and sent via the postal system each time! I’m super proud to be the facilitator of this swap, and I want to invite you to try it out. You will create ten handmade postcards (painted, quilted, embroidered or doodled – artist’s choice), and then in November you’ll receive ten handmade postcards sent directly from the creators to your home. Doesn’t it sound just… juicy? I hope you will think so and consider signing up. The joy of finding a handmade, personalized postcard in the mail box is hard to beat. There are lots of opportunities to share your work online as well and you’ll find inspiration on my blog. I plan to encourage you here through my blog as you are creating your postcards. Join the DIY Postcard Swap today! I hope this will give you plenty of time to finish your postcards. There’s a small participation fee, but at the cost of a great coffee this swap will generate a lot more happiness over several days of creating, sharing and connecting with others. Please read the swap information with dates, inspiration and rules if you’re new to the swap. 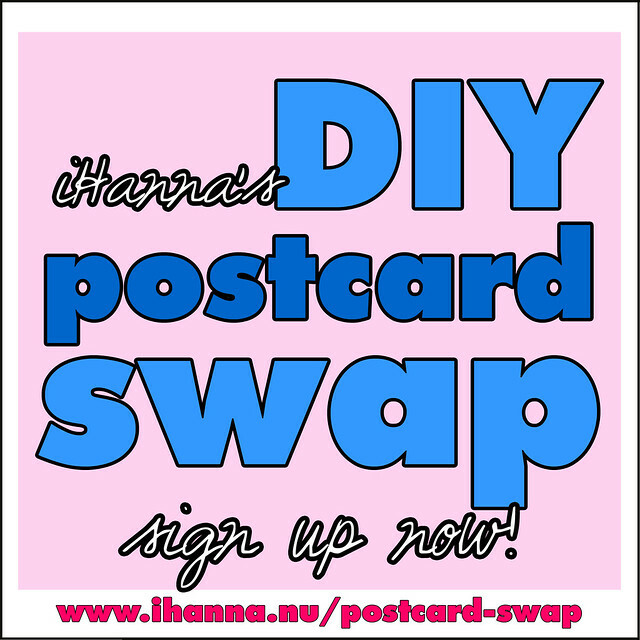 Also feel free to join the iHanna Newsletter – sign up if you want to swap handmade postcards next year too. I rarely send out my newsletter, but you don’t want to miss it. In it you will be informed of all things new and cool around here. Click the button above that you like most, save the bigger image to your computer and upload it to where you want to share it. If it’s on your blog link it to the info page, thanks. You sharing the swap with your friends helps me a lot, and I appreciate it immensely. If you have any questions, let me know. Frequently Asked Questions – what size should you create in, what medium, should you put your postcards in an envelope? Check out the FAQ. Click here if you’re ready to sign up! PS: Did you sign up? Please let me know what mediums you will be creating your postcards with this time. Or if you don’t know yet, what inspires you most right now? I’d love to know what your ideas are, so leave a comment below and share some of your enthusiasm too. Thanks. This entry was posted in A Creative Life, Mail bliss and tagged DIY, postcard swap. Bookmark the permalink. Hi Hanna! Hooray for your postcard swap! The best postcard swap in the world!! I’ve had a few conversations recently with some gals i met via your previous swaps, and we’ve been saying how much all of us are looking forward to hearing your announcement for the 2nd swap of 2016, and here it is :) Xcited! I have really been into coloring/coloring books lately. Not long ago, I did a page from one of my coloring books, which i cut out-framed-and gave to someone as a birthday gift. I had copies of it made in a smaller size (the original page was 8×8 inches) I think I will use those for my postcards and add some doodles/paint/stamping. I’ll be signing up in the next few days. Thank you so much for doing this-it’s always so much fun!!!! ps, I will also be using your postcard back sides-love those! Aw, thank you Jenny, so glad you think it’s so great. I am biased but I kind of agree! ;-) There already a lot of people signed up, so I’m keeping busy. Can’t wait to see your postcards. I am really very excited about this swap, but also a little nervous, which is why I haven’t signed up yet. For some reason I am just afraid that if I impose a deadline on myself I won’t be able to create anything! Does anyone else ever feel that way? I hope you get over your nervousness, do not fear this! But if you’re worried you won’t find the time to finish all 10 postcards on time, I encourage you to make them before you sign up. There is plenty of time before I close the gates for this round, so create freely and sign up in a week or two perhaps? Good luck! 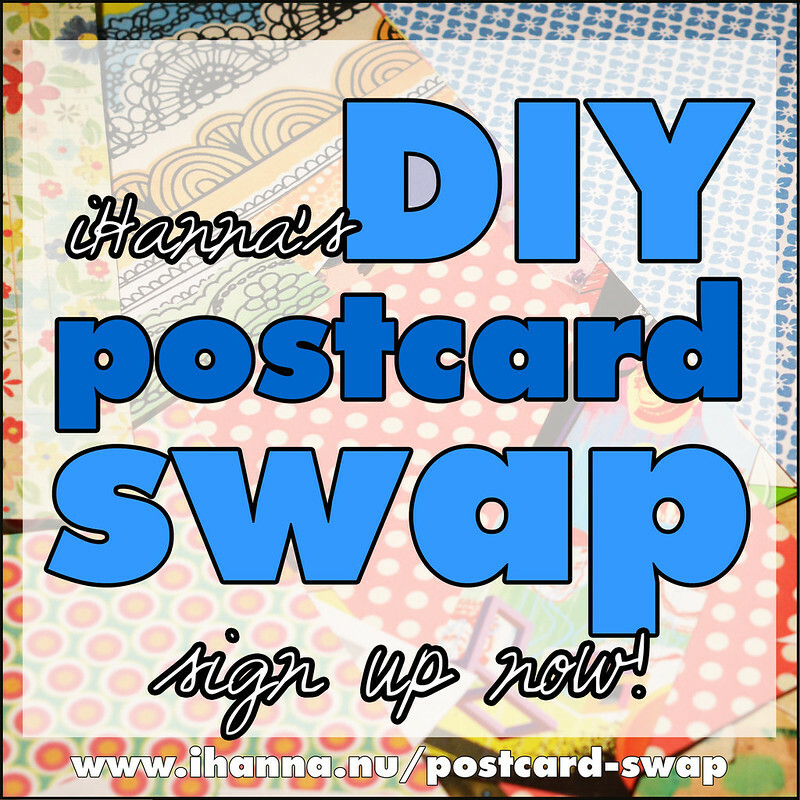 Hi Hanna – I signed up for the postcard swap a few weeks ago and unfortunately will not be able to participate. Thank you for your understanding and I look forward to participating in your next swap. Thanks for letting me know Kristen. I hope you can join next time. Take care of yourself and your family. Hi Juniebird, I just wanted to encourage you and tell you how much fun I have had doing Hanna’s postcard swap. This one will be my 6th swap in a row. Sometimes, I already have an idea I want to use for my postcards, other times, I just start smearing paint, gluing bits/pieces down, stamping, doodles, etc, etc. Sometimes, I have waited till the last minute to start my cards, and other times (like this swap) I am almost finished with my cards. Don’t let the deadline scare you away :) I think you will enjoy making your cards, and then, once the postcards from other’s start arriving….That’s another part of the fun! I always make extra postcards, to send to family/friends, a few go to people from previous swaps! and I always send one to myself :) I bet you will really enjoy Hanna’s postcard swap-she does a great job organizing it and inspiring us along the way. Hi. I am really intrigued by your postcard swap but am nervous about my creations not being very good. I am fairly new to “arting” though I love it! I mess around in my journals having some pages that turn out well and some not so much. I wonder how the cards are mailed. If they have texture and bumpy things would they be sent in an envelope or do they go “as is”? I am going to consider this project during the next few days and hope to convince myself to participate. Hi Pat, I’m glad you found your way to the swap information, and glad you’re considering it. I don’t think you need to be nervous about your art being good enough, all art is awesome in my eyes! Some of us have been doing art many years, others are new to experimenting with it, but all are welcome and my hope with hosting this swap is that everyone should feel welcomed and encouraged!